View full 2018 Texas race results below. Ryan Blaney and Clint Bowyer set the front row. They’ll lead the field to the starting line in the 500 mile event. Green flag, Ryan Blaney is clear before the flag stand. Bowyer got a horrible jump, Harvick has a look on the inside to make it three wide for 2nd, he backs out of it. Bowyer gets loose on the bottom! Bowyer slides up the hill and gets into the door of Hamlin. Lap 3, Hamlin is dropping through the field, he has a fender rub. Lap 10, Denny Hamlin heads to the pit lane. Lap 11, Clint Bowyer hits pit lane as well. Both of these stops are under green. Hamlin returns once again, he’ll be three laps down after two green flag stops. Lap 25, Kevin Harvick has run down Ryan Blaney. They race through lap traffic. Harvick has a look into turn one, Blaney shuts the door. Lap 31, the competition caution is out. The field heads for the pits. Two tires for Harvick, he’s off first. Blaney is the first car with four tires, he’s off pit lane 6th. Green, Harvick gets the jump on Kurt Busch. Stenhouse holds 3rd. Blaney is coming to the front on the outside. 10 to go in stage 1, Harvick leads Kurt Busch by 2.9 seconds. Kyle Busch restarted 24th after the competition caution, he’s up to 9th. Kevin Harvick wins stage 1 at in the NASCAR race at Texas Motor Speedway! The field heads for the pit lane. Harvick is first in and first off. Green, Harvick noses ahead at the line. Kurt Busch is hanging onto his right rear. Busch drives it deep on the outside. Busch is clear but he runs wide at the exit. Harvick drives back by on the bottom. Logano takes 2nd. lap 96, William Byron is around in turn four. Jimmie Johnson got sideways in front of him. Byron jumped on the brakes and made light contact on the bumper of the #48 before spinning. Green, Logano is even with Harvick at the line. Logano noses ahead in the middle of turn one. Harvick fights back on the bottom. Logano lifts and gives him the spot. Lap 126, Erik Jones head to the pit lane under green. He begins the pit cycle. Lap 132, Kyle Busch and Kyle Larson head to the pit lane. Lap 133, Kevin Harvick pits from the lead. Joey Logano remains on the race track. Busch returns to pit road with a vibration. Lap 152, Logano finally hits the pit lane, Six cars remain on the track. Harvick is up to 5th. 12 to go in stage two, Harvick cycles back to the front. He leads Johnson by 1.2 seconds. Blaney is 4.4 seconds back in 3rd. Bowyer has been handed a penalty. The crew was over the wall too soon. A crew member was sitting on the wall with his feet in the pit box. He didn’t do anything on the car but he was sitting over the wall on the car side of the wall. Bowyer is already three laps down. Kevin Harvick wins stage two at Texas Motor Speedway! The field heads to the pit lane. Logano and Keselowski are out first with just two tires. Blaney is off in 4th, he’s the first car with four tires. Green, Logano and Keselowski run side by side into turn one. Logano chose the outside lane, that doesn’t work. Keselowski completes the pass on the bottom into turn three. Lap 225, Suarez is in the wall. He went into turn one and the car went straight. He had a flat right front. The caution is out. The field heads for the pit lane. Joey Logano picks up three positions at the pit exit line. He’ll lead them to the restart. Green, Logano gets the jump on Ryan Blaney. Harvick moves around Blaney on the outside in turn one, move him to 2nd. Lap 246, Harvick is on the bumper of Logano for the lead. 10 laps ago, Harvick thought he had a loose wheel. Truex heads to the pit lane with a loose wheel. Penalty for Truex, he drove through too many boxes. Lap 254, Logano is struggling to hold the bottom. He boucned off the apron a few laps ago. Now, he’s washing up the track off turn two. Harvick drives by on the inside. Harvick takes the lead. 54 to go, Almirola hits the pit lane. 53 to go, Harvick pits from the lead and he brings Blaney with him. 42 to go, the pit cycle is complete. Harvick cycles back to the lead. Blaney and Almirola trail him by 4.5 seconds. 37 to go, David Starr is around just ahead of the leader. He might have had a flat or a mechanical failure. Green, they’re even into turn one. Blaney is on the gas around the top, he’s nearly clear. Harvick is fighting back on the bottom. Harvick clears him heading into turn three. Almirola gets loose and skates up the track and nearly spins Logano! Almirola lost a ton of positions. 28 to go, Matt DiBenedetto is in the wall. Bubba Wallace thought he was clear on Buescher, he wasn’t. That stacked up the field and left DiBenedetto with nowhere to go. He’s going off on the hook. The caution is back out. Green, they’re even at the line. Blaney noses ahead into the corner. He’s on the gas again around the outside. He makes it stick on the outside, Harvick can’t get to him. Blaney is clear heading into turn three. 19 to go, Harvick is on the bumper of Blaney. Harvick is better in turn one. Blaney can’t hold it on the white line. 18 to go, Harvick is on his bumper. Blaney gets aero loose off turn two. Harvick drives by on the bottom. 5 to go, Kevin Harvick is driving away. He cruises away from Blaney. He leads by 2.1 seconds. 3 to go, the caution is out! Joey Gase is around. Buescher got loose under him. Suarez also got into the wall. It’s a Texas shootout to the finish! Green, Larson gives a huge push to Blaney on the inside lane. Blaney noses ahead into turn one. Harvick is on the gas around the top. He smokes him off the corner. Harvick is clear by several car lengths. 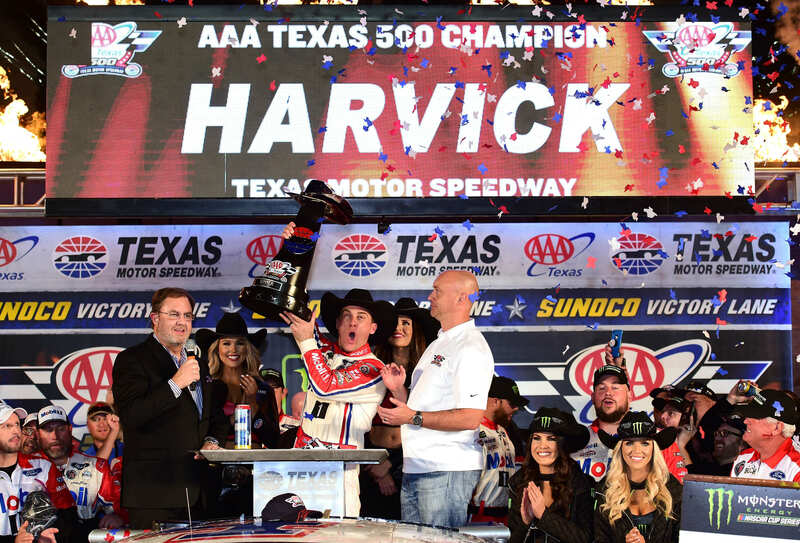 Kevin Harvick wins at Texas Motor Speedway! 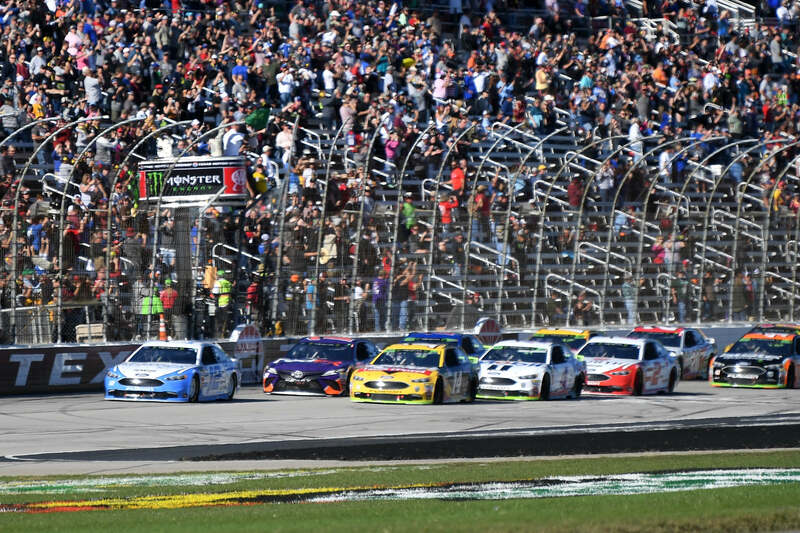 View full NASCAR race results from Texas Motor Speedway below.